Hogline BBQ team of Mary and Dustin Reese accepts the grand champion awards from Corey Linton. Hogline BBQ and its head cook, Dustin Reese, of Owatonna, Minn., captured the top score – and the judges’ palates – to take home the grand championship prize of $3,000. 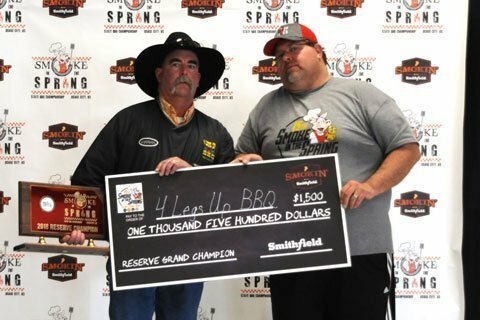 The team’s win took away bragging rights from the defending two-time Smoke in the Spring championship team of the Clark Crew BBQ and Travis Clark, of Yukon, Okla.
4 Legs Up BBQ, with head cook Kelly Wertz, of Great Bend, Kan., turned in the second best scored samples to take reserve grand champion and the $1,500 prize money. Hogline BBQ’s chicken sample shot the team to the top with a perfect 180 score and first place in that category. The team also took home extra prize money in two other categories, placing ninth in brisket and ninth in pork, but turned in one non-prize winner at 31st in ribs. 4 Legs Up BBQ won reserve champion by taking third in brisket, 10th in pork, and finishing just out of the money at 16th in both chicken and ribs. 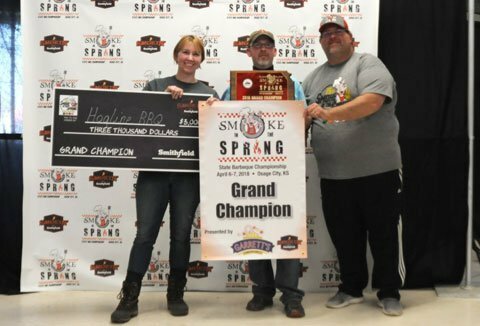 While no longer Smoke in the Spring’s grand champion, Clark Crew BBQ still took home prize money, finishing sixth place overall with fourth in brisket, fifth in ribs, 12th in chicken, and 42nd in pork. The contest boasted of $21,000 in prize money, with cash prizes awarded to 15th place in the four main categories of chicken, ribs, pork and brisket. This year’s payout was boosted with a contest grant of $4,500 from Smithfield Foods and the Smokin’ With Smithfield program. Cooks were able to compete in an ancillary category, pork loin, sponsored by Smithfield, which also provided the pork loins for competition. Taking first place in the pork loin category was Man Meat BBQ, Aaron Stoffer, head cook, of Stilwell, Kan. Indigo Pig, with head cook Robert Bennett, of Silver Lake, Kan., won first place in the other ancillary category of dessert. The Kansas City Barbeque Society-sanctioned contest drew 104 teams this year, with entries judged by 126 certified barbecue judges and table captains. KCBS contest representatives included Dennis and Linda Polson, Kim Collier, Dave and Peggy Rogers, and John Grimes. Corey Linton, Osage City Parks and Recreation director, is the contest organizer. The next Smoke in the Spring is scheduled for April 12-13, 2019. 4 Legs Up BBQ head cook Kelly Wertz accepts the reserve grand champion awards from Smoke in the Spring organizer Corey Linton. Updated to note rescheduled date of 2019 Smoke in the Spring.